4 chicken breast fillets washed & butterflied. Gently flatten fillets between 2 sheets wax paper with a mallet. Cut fine slices of chorizo sausage and place down center of fillet. Grate mozarella cheese over sausage. Roll up chicken fillets and secure with toothpicks. In a saucepan, sauté fillets in 3 tbs Parmalat garlic and parsley butter for 5 mins just to seal. Remove fillets and pour butter in roasting dish in preheated oven and roast further for 15 to 20 minutes. Retain the juices of the chicken add 1/4 cup white wine ( optional ) if not using wine add some chicken stock. Bring to boil in saucepan, let liquid reduce by half, add 1/2 tsp paprika, pinch of cayenne pepper; taste for salt. Add 1/4 cup Nandos Garlic sauce and 3 tbsp fresh cream. Heat through. 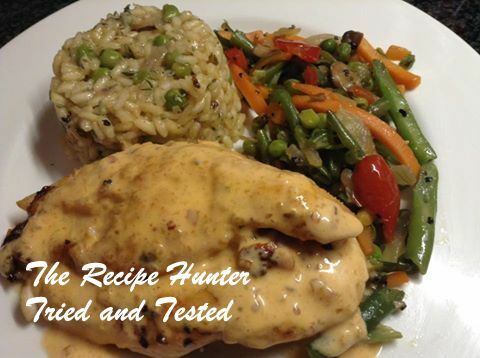 Serve sauce with stuffed chicken fillet. Cook risotto rice according to packet instructions. I added 1/2 cup wine, ( if not using wine increase chicken stock), 1 cup chicken stock, 6 chopped button mushrooms, chopped onion and garlic, and 1/4 cup frozen peas, 1/2 teaspoon thyme, salt and black pepper., 2 tbsp grated parmesan cheese. Stir 1 tbsp butter through before serving.